17" clock birch clock, trimmed in cherry wood ring. 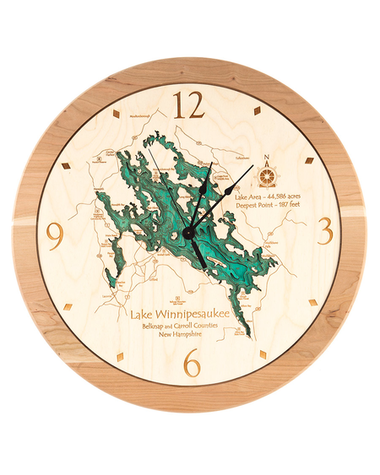 The clock face features all the topographical details surrounding your lake, with three additional layers cut-out and stepped down representing the depth contours of your lake. 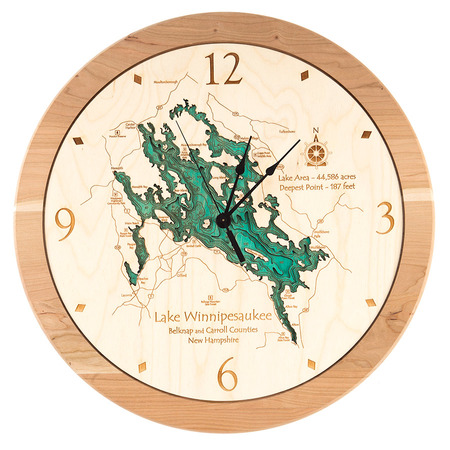 Additional contours of the lake are etched as opposed to cut. The clock is powered by one AA battery and ready to hang. Thanks for the great clock. It will be perfect at the lake and I'm excited to show it to our kids. I haven't tried it out yet since we don't really get to the lake until next month. Wow ! It was a gift to my Daughter and of all of them I have given her this !4 inch clock made a BIG BIG hit. Well worth the money . Great co. to work with. I am sure the clock will be remembered for many years along with Dad who gave it to her.